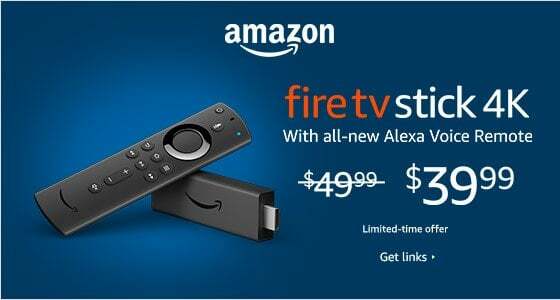 Amazon is offering free streaming On Fire TV streaming device, discounts on Deadpool’s 4K Ultra HD picks, Valenteine’s Day gifts and much more for their 2019 promotion, “New Year New You.” See all current live deals on the Today’s Deals Page. You can stream the big game live for free on any Fire TV streaming device. You just need to download the CBS Sports HQ app (no login required) on your Fire TV streaming device and enjoy! And for a limited time only, yous can score $10 off Fire TV Stick, $40 off Fire TV Cube and $40 off Fire TV Recast. Now through February 2, you can create the ultimate big game viewing experience with home entertainment products including TVs, projectors, sound bars, home audio speakers and more. Check out products and deals from brands including Sony, LG, Samsung, Sonos and more. The Life-Changing Magic of Audible! Marie Kondo’s new Netflix series has pushed her book into the Audible Top Ten Trials for January. You will want to listen to this best-seller while you do your own tidying up – what’s more conducive to sorting than listening to the master while you’re doing it! You (especially parents) can find budget friendly Valentine’s Day gifts for the kids (and young at heart) in your lives with Amazon’s curated selection of popular stuffed bears, collectibles and more. The Wait is Over. Carmen Sandiego is Here. For decades, people have asked the question: Where in the World is Carmen Sandiego? But just who is this infamous globe-trotting criminal? Now, it’s time to find out. In this exciting listen based on the Netflix animated series, Carmen shares her own backstory for the first time ever. You can get this audiobook (plus a second title) FREE with an Audible Free Trial signup! You can get free trials of new magazines every month through the world of Kindle Unlimited! Kindle Unlimited provides access to over 60 best-selling magazines such as Men’s Journal, Marie Claire, Vogue and more. Now through February 16, you can save $50 off the Harman Kardon Allure Smart Speaker and $40 off the Allure Portable Smart Speaker. With these speakers, you an experience high-quality sound while having access to Alexa. Calling all movie lovers. Now through March 10, you can find the Academy Award nominated movies in one spot on Amazon. You can buy, rent or stream these movies before, during and after the movie awards season. Now through February 4, check out Professor Pool’s guide to 4K Ultra HD and his handpicked favorite 4K titles on Amazon.